SFA Super Cozy Arcade and Super Cozy Jam! I'm stoked to announce that Super Friendship Arcade, Cape Town's favourite experimental games party is back! 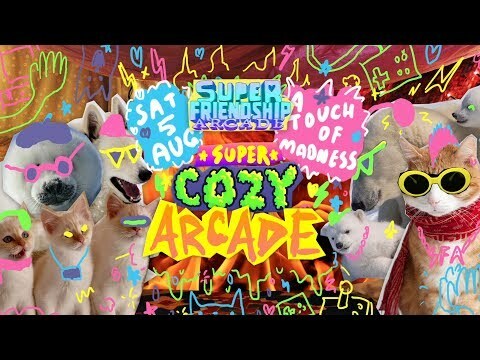 On Saturday, the 5th of August, we'll be invading A Touch Of Madness for our next event; Super Cozy Arcade! In preparation, we'll be getting together this Sunday, at Touch Of Madness to make new games, build new controllers and create some decor. Please join us for Super Cozy Jam! Otherwise, if anyone has been working on any fun/ weird/ multiplayer/ party games (or anything else that you feel could be a good fit on the night) please let us know. We'd love to check them out! Super Friendship Arcade. Cape Town's favourite video game punk party is back! Join us as we cuddle up for our snuggest celebration yet, SUPER COZY ARCADE! Wanna get involved in making this magic come together? Come make things with us this Sunday at Super Friendship Arcade: Super Cozy Jam! Spread the word, tell all your friends, bundle up, prepare for the most cozy alternative games party ever and get down to Super Cozy Arcade! Confused about WTF Super Friendship Arcade is? SFA is a series of pop up events designed to paint video games in a new light, break down pre-exsisting ideas of who games are for, grow more diverse communites of game makers and game developers, turn strangers into friends and generally save The World through the powers of kindness, rebelion and creativity! In preparation of Super Cozy Arcade (the next celebration from experimental party punx, Super Friendship Arcade), join us in making things at Super Cozy Arcade! * Radical new multiplayer games! In an unpressedented SFA first, we're able to host the jam at the very same venue as the actual Arcade! This means you can test out your creations in the space that people will experience them on the big night! Bonus round! A Touch of Madness also serves awesome food and beverages! No need to interupt your creative rampage! Random decor-able stuff that feels cozy! This news is going live pretty last minute, so please please please help us out by inviting your friends spreading the word! Made a promo video for the big night! Just two days until Super Cozy Arcade! If you're Cape Town based, it'll well worth checking out! Hey, so, painfully noobie question from someone who's never attended a jam: on a scale of Skeleton key to E-toll license disk in Cape Town, how useless is a digital artist at this event if their rig isn't mobile? @Wes_Matthews the jam happened on July 23rd - so bringing your rig to the party on Saturday would probably not be useful :P.
Sorry you missed the jam @Wes_Matthews - don't miss out on the main event tomorrow night! A) ...totally welcome to bring along a desktop if you have one and feel like lugging it around. B) ... definitely encouraged to come jam regardless of what equipment you have access to. SFA is all about growing the community by lowering the barriers of entry that people generally associate with making games. No one should be put off if they don't have access to a laptop/ tablet/ phone (or anything else) to work on; as mentioned in the jam's description, the only things you need are yourself, fun ideas and enthusiasm to put them in to action! The party was soooo good last night. Super rad games, super rad people and a super rad venue! The Friendship Arcade team! Yeah, it was really excellent! Major thanks and high fives to everyone that created things for the party! We got to show off 5 brand new games and 3 brand new custom controllers made by the community, plus some other great SA titles, some of our older controllers and some really exciting titles from abroad. We're waiting on some photos and then I'll share a bit of a breakdown of all the cool stuff that we had on show. For now, I just wanted to echo @EvanGreenwood's super-posive report; Super Cozy Arcade was sooooo good!